Gordon Ramsay, everyone’s favorite mean chef has hated on vegans in the past, even joking he’s allergic to vegans. He surprised everyone last summer when he revealed on Instagram that he was “giving this vegan thing a try.” He wasn’t actually committing to a vegan lifestyle, but he did add a vegan option to Gordon Ramsay Street Pizza. Now, it seems Chef Ramsay is embracing vegan food once more, or at the very least cashing in on it. Gordon Ramsay posted a photo on Instagram of a vegan Beet Wellington this time with the caption, “Oh lord it’s happened…..we’re giving #veganuary a go this year!” Bread Street Kitchen, one of the restaurants also posted it on their Instagram account. Veganuary is a challenge millions of people accept to eat vegan all January long. The hope is that they’d commit to a vegan lifestyle beyond that, but even eating vegan for a month can make a change. Until February 13th, Gordon Ramsay’s Bread Street Kitchen and Heddon Street Kitchen restaurants in London will offer a plant-based menu. The starters on the menu include “roasted Ironbark pumpkin soup, toasted hazelnuts and truffle oil, a superfood salad served with avocado, kale, cucumber and nuts or heritage beetroot with toasted hazelnuts and balsamic vinegar.” Dessert includes “chocolate avocado and almond mousse, banana sundae served with walnuts and maple syrup, or pineapple carpaccio” and the main dishes available are the Beet Wellington as well as Ramsay’s famous vegan Street Pizza. Vegans in London are certainly in luck with such a luxurious vegan menu offered by a famous chef. However, this is even more exciting news for non-vegans who will taste these exquisite dishes and learn how amazing vegan food can be! Katie Culpin and Josh Bailey‘s deliciously flaky and warm Wellington is a gorgeous dinner treat for any time of the year. A pastry sheet is filled with a savory and herbed mixture of mushrooms and pecans, topped with a lattice layer of strips, and then baked until golden brown. The crispiness of the pastry is so tantalizingly tasty, and pairs wonderfully with a fresh salad or roasted vegetables. This Lentil Pizza Crust by Amarilis Moldes is surprisingly easy and delicious. Suitable for everyone. Only three ingredients! Vegan and Gluten-free! Avocados are packed with nutrients such as an array of B vitamins, potassium, vitamin C, vitamin E, antioxidants, healthy fats, and fiber. Not to mention the scrumptiously creamy texture and neutral flavor that allow for versatility and use in a variety of recipes, including desserts! 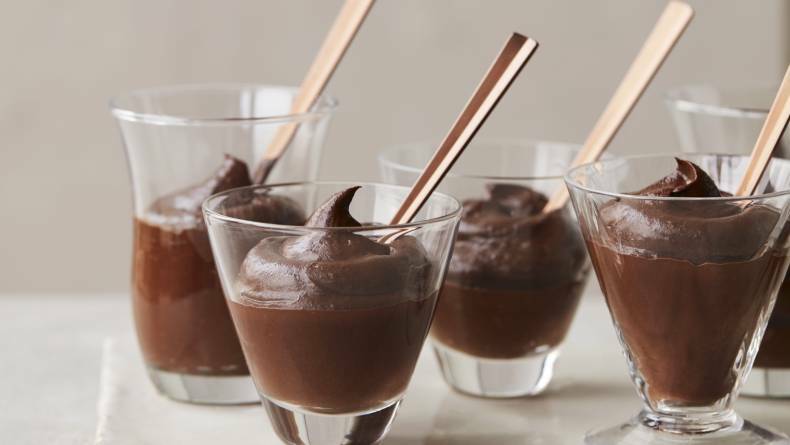 Not only is Christina Bedetta‘s vegan chocolate mousse packed with nutrients, it is also free of refined sugar and common allergens such as nuts and gluten. It is super rich, delicious, and perfect for entertaining or simply sharing with someone you love. If you’re in London, we hope you’re able to enjoy Gordon Ramsay’s vegan menu. For delicious vegan recipes, download our Food Monster App where we have over 15,000 vegan and allergy-friendly recipes!